Here are more than a dozen smart phone alternatives to the iPhone 8, 8 Plus or X . Let’s start with the list, and then get to the details. For comparisons to iPhone specifications, the iPhone 8 has 4.7 inch display, the 8 Plus is 5.5 inches and the X is 5.7 inches. All iPhone models have a 12 mega-pixel camera, and “Qi” wireless charging . With it’s 6.3 inch screen, you get 10% more diagonal glass than the iPhone X and 15% more than the 8. Combine this with a sleek design featuring narrow edge bezels to get even more usable glass area. But the standout feature of the Note 8 is its dual-lens camera. Like the iPhone Plus, the Note 8 has one wide-angle lens and a second telephoto lens. To maximize photo and video capabilities, Samsung includes their proprietary optical image stabilization (OIS) on both lenses. Apple, on the other hand, only offers (OIS) on its wide-angle lens. That’s a problem because when you zoom in on a subject, every slight movement of your hand becomes drastically exaggerated. By adding OIS to the Note 8’s telephoto lens, Samsung ensures that zoomed images will come out crisp without blurring caused by hand jitter. The Pixel 2 comes in two sizes and 4 colors (Black, White, Blue, Black&White). The standard 2 has a 5 inch display: FHD (1920 x 1080) AMOLED at 441 ppi. And the 2XL comes with a 6 inch display: QHD+ (2880 x 1440) pOLED at 538ppi. The camera is one of the highest quality you can get on a smartphone, but not a dual lens system you’d find on the Apple or Samsung. An advantage Google has over the Android competition is that the Pixel runs on the purest version of the OS, providing fast responsiveness and optimized code. Pixel smartphones will also be first in line for the Android O update expected later this year. One noticeable drawback is the fingerprint reader on the back of the phone isn’t the same resolution as Apple’s Touch ID, and of course, no facial recognition for unlocking at this time. Similar to Amazon’s Alexa and Apple’s Siri, the Google Pixel 2 comes with their AI (“Google”). Rather than always listening for a key-word phrase, with a squeeze of the phone, you can launch your Google Assistant for real-time help and voice commands. A bonus feature from Google – Never delete a shot with free unlimited storage for all your photos and videos in original quality. If you are all-in for the Google system of products, when you buy a Pixel 2, you’ll get a promo code for a complimentary Google Home Mini. This Moto smartphone from parent company Lenovo makes the list primarily for it’s low price for an unlocked phone – $270. The camera features are fairly standard, a 12 MP rear camera and a 5 MP wide angle front facing camera. You can also upgrade the memory another 128 GB using a standard nano-SIM card. The fingerprint / ID reader is at least as good as the iPhone, and Motorola took it a step further by adding a handful of shortcut gestures that turn the fingerprint sensor into a mini touchpad, a feature it calls “One Button Nav”. Once you turn it on in the Moto app, tapping the fingerprint sensor brings you home. If you swipe left, it shows your recent apps. If you swipe right, it goes back. If you long press, you lock the phone and if you tap and hold, Google Assistant pops up. The X4 will be available in Fall 2017, just in time for Black Friday promotions (you can register for updates and get on the mailing list for when it is released). Based on the current European models, the pricing should be under $500, which is a big advantage to the current iPhone – you’ll be paying half of what the comparable iPhone 8 costs. Two features really set the dual cameras (12MP and 8MP, with wide angle) apart from the others smartphones. The new Landmark Detection feature lets the camera serve as your eye to the world – just point the lens at an object of interest and it will automatically ask if you want to learn more about what you’re seeing. It can even scan a business card and quickly add the info to your contacts. Or if you’re looking to spice up your selfies, try out the Face Filters feature, which lets you add a layer of animations to your photos or videos. Add a blurred background to take professional looking portraits and be among the first to experiment with new beta features that let you use selective black and white or color or even change the background. Dual Autofocus Pixel technology also means a faster focus in low light so you get professional quality pictures, and the wide angle lens lets you capture even more. The XZ1 boasts the industry’s leading camera at 19 mega-pixels, compare with 12 MP for the iPhone 8. Behind the camera, the processing capabilities are also leading-edge. Start with the ability to auto-burst capture multiple still images, and then select the exposure you like best. Next is super slow motion when recording at 960 fps (frames per second), the fastest video capture rate for all smartphones. Compared with standard 60 fps HD recording, when capturing 16x more frames means you get slow motion HD resolution at 1/16 th seconds. Just imagine the action sequence or sporting moments you can record, play back and analyze! To match the camera features, the XZ1 Premium comes with a 4K display. Again, Sony leads the industry by putting this much resolution into a smartphone. Another first from Sony – Check out 3D Creator. Take an object; your face, your pet, your dinner—scan it, turn it into a 3D avatar, and print it. Since this is from Sony, they have made the smartphone inter-operable with their flagship video gaming system. If you’re hooked up to the Wi-Fi at home, you can play a game on the PlayStation 4 ($399) from the comfort of your phone. The S8 takes our top spot for pure visual look. Samsung describes their “Infinity Display” as an incredible end-to-end screen that spills over the phone’s sides. The hardened surface forms a completely smooth, continuous surface with no bumps or angles. It’s pure, pristine, uninterrupted glass. And it takes up the entire front of the phone, flowing seamlessly into the aluminum shell. Similar to the Apple facial recognition, “Iris Scanning” is the new unlock / security feature on the Galaxy S8 and S8+. Your irises have patterns that are unique to you, and they’re nearly impossible to replicate. (FYI – The iris is the colored, ring-shaped part of your eye). And what would a smartphone be without a built-in AI. Samsung brings you “Bixby”. Bixby completely changes the way you interact with your phone. It’s a personal assistant that understands talk, text, and taps so you’re never confined to one mode of communication. The HTC U11 with HTC Alexa is the world’s first smartphone to launch Amazon’s Alexa voice service hands-free by simply saying ‘Alexa’. If you are more of a Google user, the U11 also has the option for using Google Assistant. So far, it’s the only smartphone to have both AIs available. Another great feature is the camera technology, allowing you to quickly and easily snap a photo just by holding up the phone and smiling. It’ll recognize that you want to take a picture. This smartphone offers an edge to edge glass similar to the Galaxy. The biggest difference is that while the S8 is curved, the G6 uses a flat display. One drawback is that these have 32 GB compared with 64 GB for most other phones in the similar price range. This smartphone offers up high-end specs at discount prices compared to the other phones on the list with similar features. It has competitive technology to Apple’s iPhone 7 and the Google Pixel phone, making it almost a generation behind. OnePlus is owned by BKK, the company behind OPPO and other phone brands. Think of this as a slimmer and curvier iPhone 7 Plus, with upgrades and a lower price tag. It has has two rear-facing cameras, 16MP and 20 MP. This one earns a spot on our list, as well as an “Amazon’s Choice” designation for it’s exceptional camera and largest capacity battery standard on a smartphone. The second-generation Leica Dual Camera with a 12MP RGB sensor and 20MP monochrome sensor allow for superb photo details. Experience revolutionary two-day battery life with a large 4000Mah battery and smart power-saving technology. Huawei supercharge technology safely charges the Device for a full day’s power in 20 minutes. The Mate 9 also comes integrated with Alexa voice service, and four noise-cancelling microphones with directional audio capture to eliminate background noise and improve call quality. One disappointment is that there is currently no support for Wi-Fi calling. This is a feature rich, reasonably priced $450 smartphone available through Amazon. This gets high marks for it’s light weight, and portability. It is the world’s thinnest dual camera system. The camera system consists of color and monochrome sensors to capture up to 200% more light than traditional phone cameras. It has a titanium body, a ceramic back and an edge-to-edge Full Display. 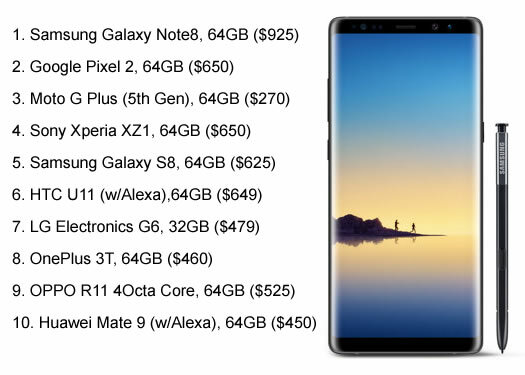 For $699, you get double the memory (128 GB) of the other phones on the list. The Nokia 8 has a 5.3-inch screen with dual 13MP camera on the rear of the phone that offers superb picture quality. Its 3,090mAh battery has a solid life of a day and a half. It’s special feature is that is the only device on the market that can take a “bothie”, a photo using both the selfie camera and the front mounted camera at the same time. For BB enthusiasts, we include the only smartphone to still be equipped with a full feature physical keyboard built into the face of the smartphone. The cameras are acceptable, 8MP front camera with flash / 12MP auto-focus large pixel rear camera, but not outstanding compared to the other phones available. It comes standard with 32 GB, compared with 64 GB of most others on this list. And the screen size is a rather small 4.5 inches. You’ll buy this only for the keyboard and the BlackBerry eco-system. If you must have Windows, the Lumia 950 XL is the best choice available. You’ll get the “One Windows” experience – Windows 10 keeps your digital files, photos, apps, etc. synchronized across all your devices through their cloud service. Also, all your apps, games, and music are in one convenient place with the Windows Store. As a Windows device, Office products (Word, Excel, Powerpoint, etc.) are easy to use. The screen is 5.7 inch Quad HD display, comparable to others on the market. The Lumia is equipped with a 20MP camera that automatically reduces motion blur, and a built-in triple LED natural flash. The Lumia 950 also supports “Continuum” which lets you use your phone like a PC on an external monitor seamlessly. And Windows Hello provides a secure and truly personal way to unlock your Lumia phone. Not wanting to pay the $1K for the latest iPhone, but still want an Apple device? Stay with the prior generation iPhone 7 Plus. This still stacks up pretty well against the iPhone X and iPhone 8. It has a 12MP dual-lens camera on the back and one of the best battery lives of an Apple device. It also has an aluminum, rather than plastic, body. Coupled with the gorilla glass, this is still one of the least breakable phones for accidental drops. Get the 7 Plus direct from Apple starting around $669.